It's no secret that Intel is getting ready to release processors for the desktop based on its Kaby Lake architecture. Some sites have even gotten ahold of the chips already and worked up some benchmarks. With Kaby Lake headed to town, there will be a rash of new motherboards, two of which MSI provided a sneak peek of on its Facebook page. 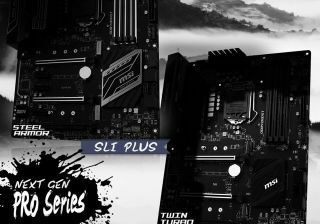 The two it decided to showcase are its upcoming Z270 SLI and Z270 SLI Plus, both of which are part of MSI's next generation Pro series for power users. MSI intentionally darkened parts of the photo, though it did seemingly confirm in the comments section that the color scheme on each one is black and white. "Black and white always goes good with everything and every color," MSI said in response to someone saying these boards wouldn't match his red and black themed build. At least one of the boards will feature reinforced PCI-Express slots (it looks like both will), which MSI calls Steel Armor. We also wouldn't be surprised if one or both boards implemented MSI's M.2 shield, a hinged aluminum flap that acts like a heatsink for M.2 form factor SSDs. Other details are in short order, though WCCFTech seems to think it's privy to additional info. Take this with a grain (or spoonful) of salt, the the site says the Z270 SLI will sport a 10-phase PWM through a single 8-pin connector, DDR4 Boost technology, six SATA III ports, dual USB 3.0 front panel header, three PCI-E 3.0 x16 slots (x16/x8/x8), and probably a sub-$200 price tag. Though there will be a bunch of new motherboards for Kaby Lake, Intel stuck with the LGA 1151 socket. That means drop-in compatibility with existing motherboards, though in most cases a BIOS update is likely needed.